Located in Oregon in the Pacific Northwest region on the West coast of United States, Portland is a city surrounded by nature. 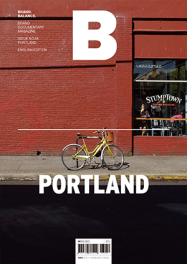 It not only serves as the headquarters of large outdoor sports brands such as Nike and Columbia Sportswear but is also home to Kinfolk, a wunderkind of magazine culture, and Stumptown Coffee Roasters, a leading force in the specialty coffee scene. Although Portland is not known for its architectural wonders or trendy shopping districts like New York or London, the city is bubbling with creativity, with products and artwork made with traditional techniques and local materials as well as alternative forms of businesses that were born of passion.